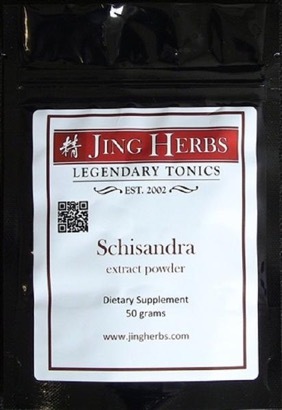 Schisandra is a Three Treasure tonic herb that was historically consumed by the Royal families of China. It is renowned for its ability to nurture beautiful, soft, and radiant skin. It is a powerful brain and memory tonic. As a sexual tonic, it increases fluids and sensitivity in woman, and has an astringing quality for male endurance. The Chinese name for Schisandra is "wu wei zi" which translates as "five flavored seed." The significance of this has to do with the therapeutic range of this herb. Its sourness and saltiness enter the Liver and also enriches the Yin of the Kidneys. The bitter and acrid flavors enter the Heart and tonifies the Lungs. Finally, the sweet flavor enters the Spleen and augments its energy. So, this incredible herb is able to tonify the Yin of all five Yin organs of the body. The more pronounced flavor of Schisandra is sour, and as such, its ability to stabilize the primal Qi of the Kidneys is more pronounced. It also is a powerful Liver tonic and helps to keep the Liver's detoxifying function running smoothly. Schisandra also has a long history of use as a beauty tonic. The Lungs are in charge of dispersing fluids to nourish the skin, and in its capacity of tonifying the Yin of the Lungs, Schisandra also enhances the Lungs' function of nourishing the skin to keep it hydrated. If there is a deficiency of Yin and Blood in the body, a person may experience what we commonly call a "Shen disturbance." These may manifest as palpitations, anxiety, insomnia, nightmares, and a general feeling of unease. One of Schisandra's many functions is that of calming the Shen and soothing the Heart. Ideal for: Anyone. This is a health and longevity tonic anyone can benefit from taking. Tcm functions: Contains the leakage of Lung Qi, tonifies the Kidneys, generates fluids, quiets the Spirit. Usage: 2 grams (approximately ½ tsp) two times per day. Mix with warm water and drink as a tea. Add to smoothies or shakes if desired. Can be taken any time throughout the day. 2 gm (approximately tsp) two times per day. Mix with warm water and drink as a tea. Add to smoothies or shakes if desired. Can be taken any time throughout the day. 50 gm packet 25 servings per packet .